When stepping into an unfamiliar brewery for the first time, one may be a bit overwhelmed with beer options. Here are a few great tips to heighten your beer experience. Look over the tap handles and tell the bartender what type of beer you usually like: “I like malty,” “I usually drink wheat beers,” “I like a lot of hoppy flavor.” This will give the bartender and idea of what type of brew you would enjoy and he or she can suggest what they have that might suit you. If you still aren’t sure what you would like, see if they have a beer sampler tray. 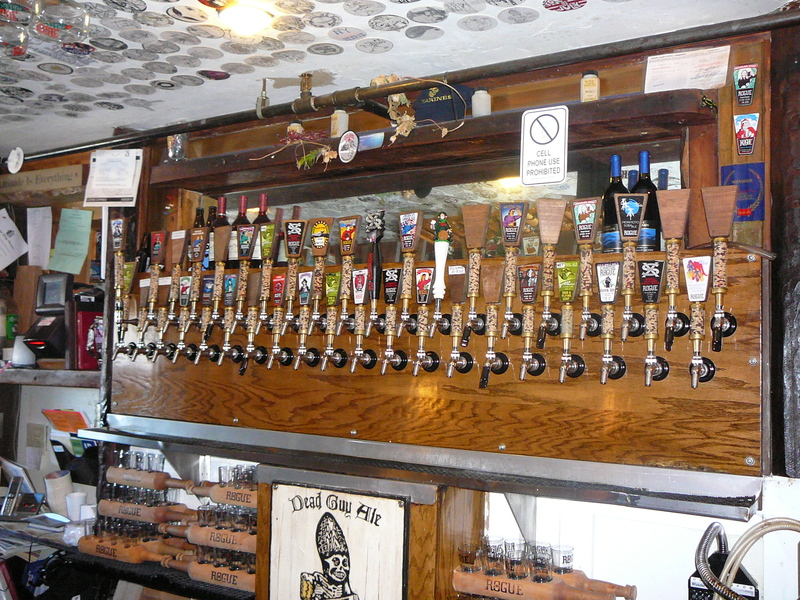 Most breweries offer some sort of sampler and usually place the beer from lowest alcohol content to highest. If they don’t have a sampler tray, ask for a sample before ordering. Many places will be glad to let you sample the brews on tap for free before ordering a full pint, but some may charge $1.00 per taste. Don’t be afraid to ask questions or ask for clarification when it comes to flavors and NEVER be ashamed to ask your bartender to exchange a beer that you do not like. Remember, your bartender is the professional and is there to help. Being a California girl, some would say I’m a bit partial to California beers. I can’t say that’s completely true but I do get excited when a brewery from my home state brews an outstanding beer. This year Anderson Valley Brewing Company brought out one of their winter seasonal favorites, Winter Solstice Seasonal Ale. Scott & I shared a pitcher of this winter warmer the other night and boy what a treat! As the beautiful dark reddish-brown ale poured into the pint glass, Belgian lace just coated the top of the pitcher. Quality! Before you take a drink, pause for a second and put your nose to the glass. 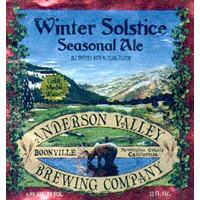 Anderson Valley brews Winter Solstice with caramel, crystal malts, and some holiday spice giving this ale a sweet, nutty, brown sugar aroma reminiscent of warm sugared hazelnuts or brown sugar Christmas candy. Now I know you must be thinking “this beer sounds too sweet Liz. How does it taste?” Well let me tell you, the taste is just as amazing as the smell. There are definitely hints of brown sugar, and did I say Christmas candy? Well, the crystal malts really give this ale a nice creamy, toasty flavor cutting the sweetness down to soft, mellow hints. But don’t get me wrong, the ale is also 6.9% ABV so it does pack a little bit of a punch. If you like toasty brown ales, you will truly enjoy this winter warmer. Winter Solstice Seasonal ale is only available from November until New Years so find some and stock up. I love this time of year! I love the changing of the leaves, the crispness in the air, and the smell of burning fire places. But, the biggest reason I love this time of year is the release of all the pumpkin beers. 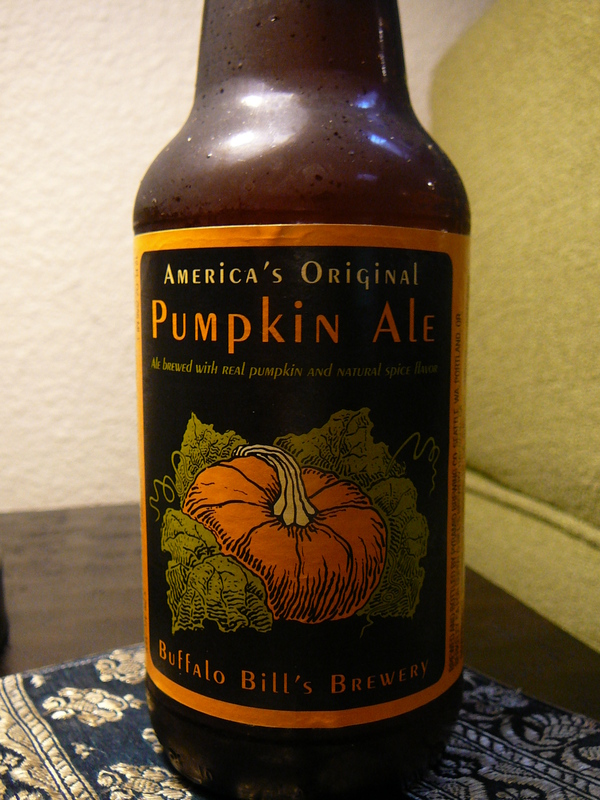 In fact, I would have to say, a good pumpkin ale is probably my favorite beer on the planet! And over the last 5 years, brewers have jumped on the pumpkin wagon and crafted some of the tastiest brews around. Now, there are dozens of breweries that brew pumpkin beer, but I’m just going to hit on my top picks. Trust me, once you try one you may not be able to put it down! About 3 weeks ago I spotted this gem at our local Tacoma Boys Farmer’s Market in Tacoma, WA. And I was glad I did! It really surprised me how subtle and smooth this beer was. A little on the toasty side with just a hint of nutmeg and vanilla. This beer was very easy to drink and I think would go great with Thanksgiving dinner…or dessert! Talk about Autumn spice! Not only is the logo on the bottle really cool, this beer really packs a punch when it comes to flavor. The spiciest beer out of my top 5 picks, Shipyard did not hold back when adding the cinnamon and nutmeg to this little beauty. Definitely not a beer to be taken lightly, it is slowly becoming one of my favorites. The spiciness of the first sip may throw you off, but keep going! You won’t be sorry!! Now I know Coors actually owns Blue Moon Brewing Company, but I have to admit, this is a great beer. 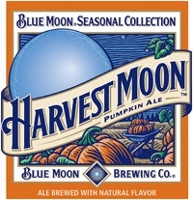 Harvest Moon’s light pumpkin flavor and soft nutmeg essence makes this beer an absolute delight. It’s very easy to drink with food but much more enjoyable on its own. While I’m a fan of Blue Moon’s popular Belgian White ale, this seasonal brew is my favorite from brewery. I discovered this gorgeous beer after moving to Washington State. 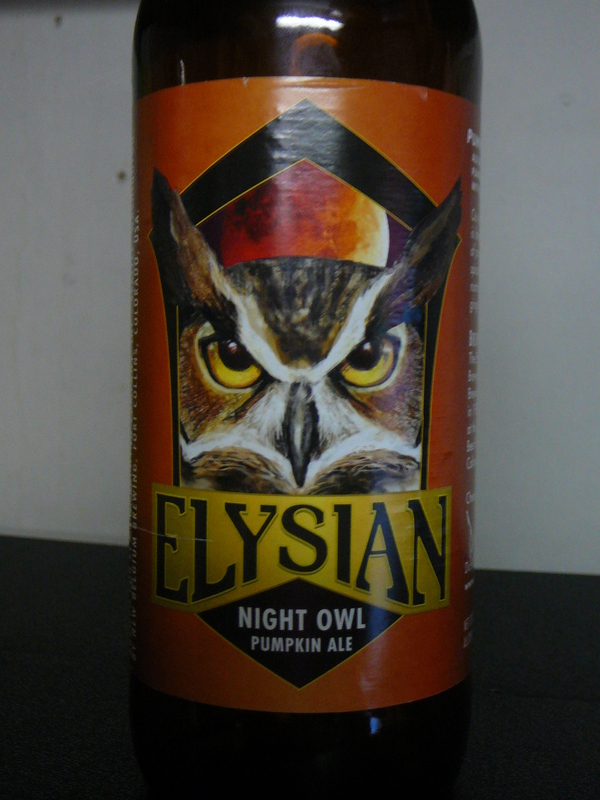 I had a hard time determining if Night Owl Pumpkin Ale should be in my #1 spot because it’s just that good! Once you crack open the bottle you are immediately hit with the wonderful aroma of pumpkin pie. Elysian adds nutmeg, allspice, cloves, cinnamon and ginger during the fermentation process. Both raw and roasted pumpkin seeds are added into the mash along with raw pumpkin. Night Owl Pumpkin ale is probably one of my favorite all around beers…period. Talk about pumpkin pie in a bottle! Brewed with baked and roasted pumpkin, Buffalo Bill’s then adds cloves, nutmeg and cinnamon creating what I consider to be absolute perfection! While you can drink this ale with a meal, I wouldn’t recommend it for the simple fact you would lose all of that wonderful spicy, pumpkin flavor and aroma. Best to drink this baby all by itself. I look forward every year to the release of this beer and stock up on it as soon as it’s available. I’m telling you, grandma’s pumpkin pie has some stiff competition! Now I know the thought of pumpkin in beer sounds kind of wacky to a lot of beer purists, but stick with me on this… once you sip a good pumpkin ale you won’t be sorry. 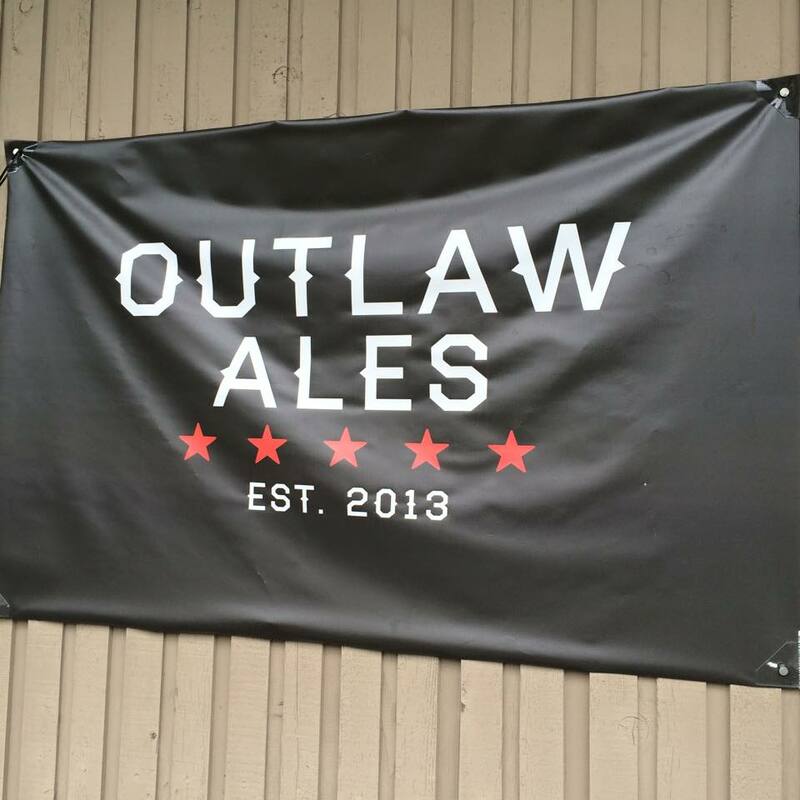 So… this being my very first blog entry, I thought I would begin with the most recent visit to a great brewery in a great town. 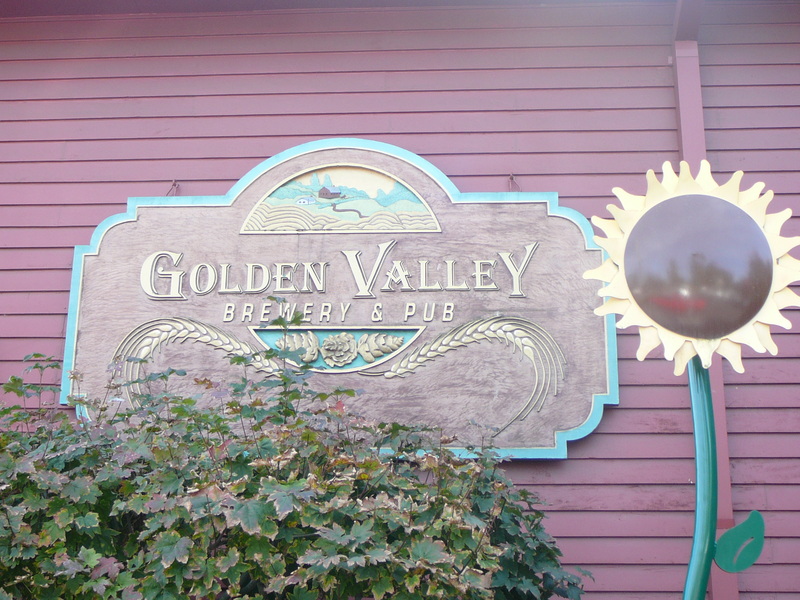 The Golden Valley Brewery in McMinnville, OR! Whoot! Whoot! 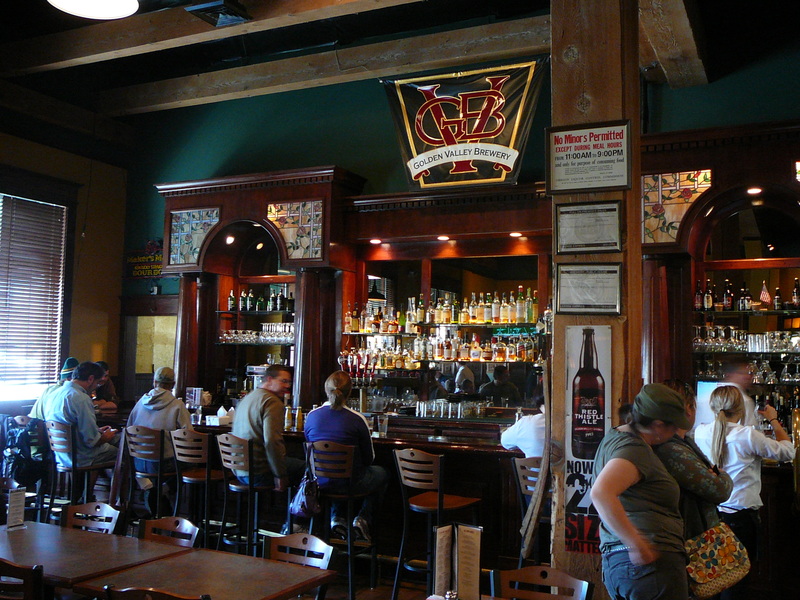 THE BAR: The brewery is nestled in the historic district of McMinnville, OR in what used to be a 1920’s warehouse. Rumor has it the massive solid wood and stained glass back bar and bar top used to be the bar that was located in the historic Hoyt Hotel in Portland, OR. Well, the story goes that the hotel burned down and the only thing left standing was the beautiful bar which now stands inside Golden Valley. Whether the story is true or not, the bar is quite stunning. THE BEER: I highly recommend ordering what I dubbed the “sampler rainbow.” Basically, the sampler consists of all the Golden Valley beers on tap – including their seasonal ale and it is served on a LARGE curved plank of wood about 2 ft long. I started off with the Red Hills Pilsner. Great caramel flavor and floral aroma that would go well with a burger. Another one of my favorites was the Third Street Wheat. Now, I love a wheat beer and this one did not disappoint. It had the great banana clove aroma and flavor that I adore and a great clean finish. Yum! The Red Thistle Ale was a very pretty beer. The color was that deep red and there was a great crisp toastiness that made me want to find the nearest fireplace and blanket. Scott chose the Chehalum Mountain IPA. Now, I’m not much of an IPA fan. To me an IPA is the equivalent of sucking on an orange rind. Scott, on the other hand, is not satisfied with an IPA until the hop taste is so strong it causes an aneurism. Needless to say, Scott really liked the IPA. And I have to admit the IPA is a really nice beer. Yes, there was a lot of hoppines to it, but it was very smooth and I actually enjoyed it. Great floral, hop aroma and I think anyone who is not an IPA fan will enjoy it. Next up, our two disappointments: the Perrydale Pale and the American Pale Ale. Both beers really fell flat from what we were expecting. Both ales were very water and Scott even compared the Perrydale Pale to Budweiser. Sad, we had such high hopes. Getting back on track we next sampled the Dundee Porter. When it’s cold, gloomy, rainy/snowy, nothing beats a good porter. The Dundee saved our tasting experience and put a smile back on our faces. Chocolate, coffee, and malts really set this one right. I was suddenly in the mood for thick sweaters, mittens and a snow hat. Next on the tasting rainbow was the chocolatey goodness of the Muddy Valley Oatmeal Stout. 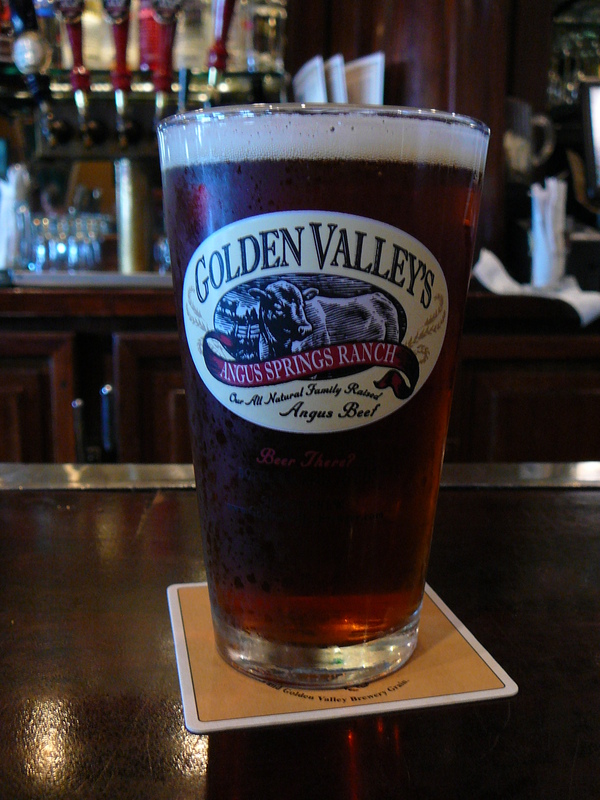 Golden Valley uses chocolate malts for this black beauty and it really comes through in both taste and aroma. I loved this beer! Last on rainbow was the seasonal Tannen Bomb (yes, it’s really spelled that way). Now this was an interesting beer and the flavor and aroma reminded me of hard liquor. And it’s no wonder! 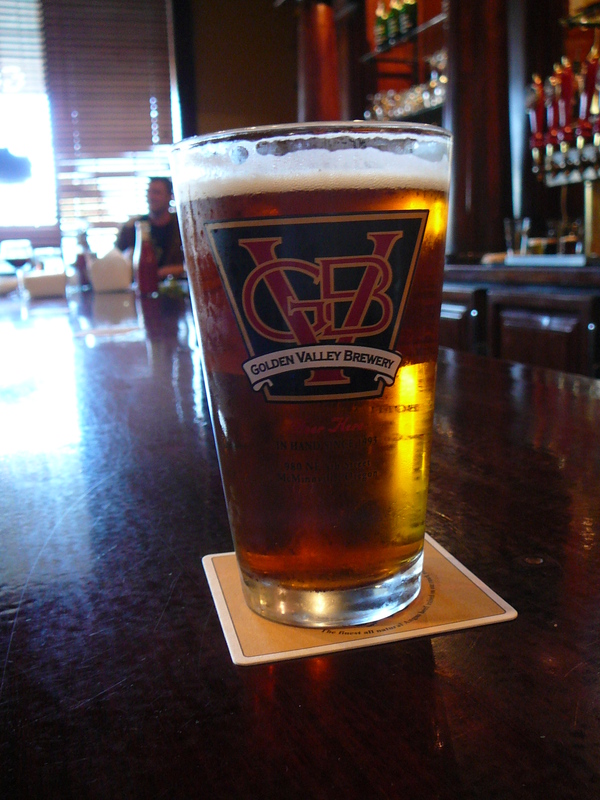 Golden Valley uses 120lbs of hops per barrel making this winter warmer 8.8% A.B.V. If you like hard liquor, you will really enjoy this particular brew. Overall, we really enjoyed our visit and even purchased a gift pack (for ourselves) which contained three 22oz bottles of the Red Thistle Ale, the Perrydale Ale, Tannen Bomb, and two logo’d pint glasses for $19.99. For and extra $10.00 they will include a Golden Valley t-shirt, but I would save the $10.00. The the t-shirt is not very impressive and looks like an iron-on my mother made for me in the 1970’s. The gift pack is a great deal although we may give the Perrydale Ale to someone who likes Budweiser.